Kansas just experienced a huge revenue downturn. State General Fund tax revenue has dropped more than $700 million in fiscal year 2014 (which closed on June 30, 2014) from the year before. This one-year revenue decline already eclipses the income losses Kansas faced over the entire Great Recession when revenue fell $618 million during a three-year period (FY 2007 to FY 2010). Receipts plummeted because FY 2014 individual income tax collections were down significantly — $712 million or 24.3 percent. The Kansas Department of Revenue has advanced an unsubstantiated explanation for the income tax drop that cites a shift of capital gains income as a key cause. The department's argument is this: In December of 2012, it seemed probable that the federal government would raise tax rates on capital gains income in 2013. According to KDOR's argument, that caused large investors to declare some of their capital gains income early — in 2012 rather than 2013 — to avoid potential higher taxes later. That, said KDOR officials, then led to lower-than-normal capital gains income claimed in tax year 2013 and hurt Kansas tax collections in FY 2014. To some degree, this capital gains tax shift likely did happen in every state, but can it possibly be the key cause of a $712 million income tax collection drop in Kansas? The chart below helps to lay out the parameters of what may have occurred, by showing the most recently available Kansas capital gains income information, compiled and publicly posted by the IRS. 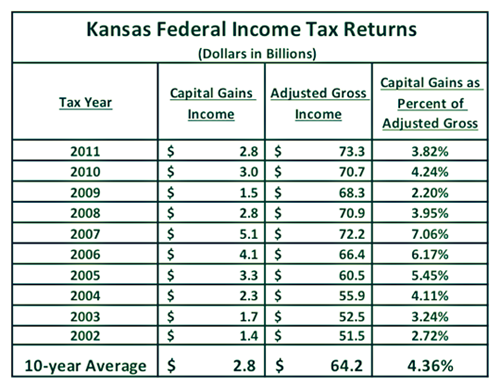 Over the ten-year period shown, Kansas capital gains income averaged $2.8 billion per year — just 4.36 percent, on average, of the adjusted gross income reported on U.S. income tax returns from Kansas. Let's assume for a moment that $3 billion in capital gains income shifted from the 2013 tax year to 2012. If such a shift had not occurred, how much more income tax would Kansas have collected for the 2013 tax year? If Kansans had claimed another $3 billion of income for 2013 and that income had been taxed at the upper rate of 4.9 percent (the highest rate in place for tax year 2013), at most $147 million would have been added to state income tax collections in FY 2014. The administration's argument therefore cannot be accurate. Even $147 million in additional tax receipts — an overly generous assumption — would not have stemmed the tide of our state's $712 million revenue drop. A capital gains shift may have played a small role, but it should be obvious that the large majority of the income slide resulted from dramatic changes in Kansas tax policy. Kansas revenue has fallen dramatically. Spending exceeded revenue by hundreds of millions in FY 2014 and will do so again in FY 2015. The state’s bank balance will be gone in less than a year. More budget cuts are ahead. Education and other programs are at high risk. Kansans, we have a very large problem on our hands!